Conspiracy theories are not new to our modern time. They date back to biblical times when Moses sent his spies to check out what the Egyptians were doing. Espionage is also linked to various conspiracies and is all mixed up in the same bag of tricks that form any decent conspiracy theory. Among the stories that are revealed in American Conspiracy Files are the circumstances surrounding the Lost Colony of Roanoke whose settlers simply left their homes and were never seen again. The tales of the deaths of Davy Crockett, Jesse James, and Butch Cassidy and the Sundance Kid leave the reader wondering just what really happened to these iconic heroes. Kross also reports on conspiracies in the Revolutionary War, including those surrounding Benedict Arnold and Ben Franklin’s son, William. He delves into the large conspiracy to kill President Lincoln and shows that John Wilkes Booth did not act alone. He then moves into our modern day with chapters on the deaths of John F. Kennedy, Robert Kennedy and Martin Luther King, spies in the Roosevelt administration, the reasons behind the Oklahoma City bombing, the sordid plots of President Lyndon Johnson and the deaths of people associated with him, and other interesting tales. Chapters on Edward Snowden; The Weather Underground; Patty Hearst; The Death of Mary Meyer; Marilyn Monroe; The Zimmerman Telegram; BCCI; Operation Northwinds; The Judge John Wood Murder Case; The Search for Nazi Gold; The Death of Frank Olsen; tons more. Over 50 chapters in all. Now Shipping! 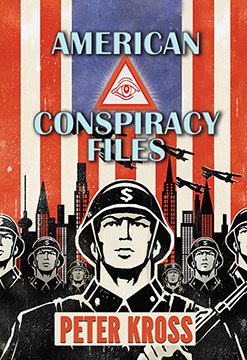 AMERICAN CONSPIRACY FILES: The Stories We Were Never Told By Peter Kross. 552 Pages. 6x9 Paperback. Illustrated. Bibliography. Footnotes.